The First Letter of John declares simply the qualities of those who truly belong to God and have fellowship with him and his Son. The verses leading up to the quoted verse declares God as light. There is no darkness in God. John means God is the source and essence of holiness, righteousness, goodness and truth; in God there is nothing that is unholy or unrighteous, evil or false. In God we find no fault. As followers, if we say we are with God, but continue to live a sinful life, then we are liars and do not act truthfully. 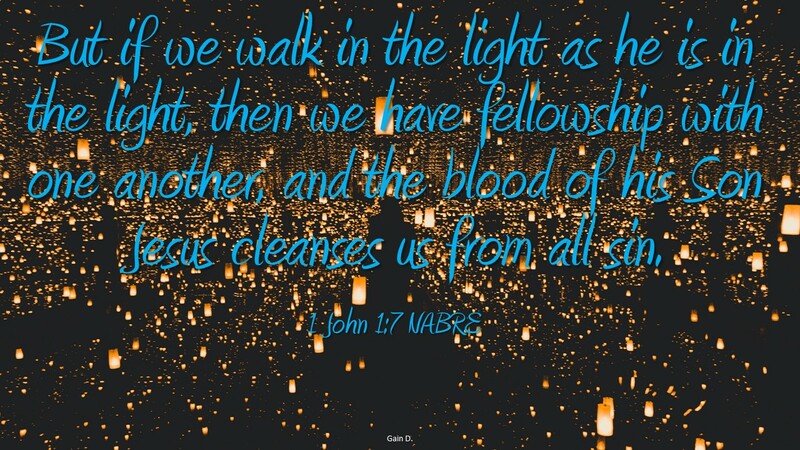 If we avoid darkness and walk in the light, we have fellowship with one another and God. Also Jesus cleanses all our sin. Followers of God are in the light, a member of the community of God, receiving the benefits of Jesus sacrifice. John makes it clear, followers of Jesus receive great reward, but are held to a standard of sinlessness and truthfulness. We must live as members who have the light shining on us perpetually. It is by our lives that we show the community of God. God’s light shines on us, and we reflect the meaning of God to all who see our light. Thus if we bring darkness into the light we separate ourselves from the light. Living a life that is visible to everyone, everywhere, all the time, should be acceptable to us as followers of Jesus. In fact it is how we are seen by God. He knows who we are, our light and our dark, and calls us to always be in the light. If you live in the light you welcome visibility and questions about God. As the song goes, you let your light shine! Can you stand the scrutiny of being in the light? Do you live a life that sets you apart and makes you a member of God’s love and community?